Very little about the early life of Flemish painter Jan van Eyck is known. His birth date was placed at around 1390. Jan van Eyck’s birthplace was thought to be in the diocese of Liège called Maaseik. He was one of the most important Northern Renaissance painters during the 15th century and was very active in Bruges. There are only a few surviving works that are attributed to him, including some illuminated miniatures and the Ghent altarpiece that he painted with his brother, Hubert van Eyck. Most of these art pieces were created between 1432 and 1439, ten of which were signed and dated with a variation of the motto he used, ALS IK KAN, which translated to “As Well As I Can” that was always written in Greek letters. He took up the position of court painter with the rank of valet de chamber of the ruler of Holland, John of Bavaria-Straubing in The Hague, although he was already a master painter with several assistants during that time. When his master died, he worked for the Duke of Burgundy, Philip the Good. The Duke had enough trust in him, sending van Eyck on several diplomatic missions. In 1428 he was sent by the Duke to Lisbon to paint a portrait of and arrange the Duke’s marriage to Infanta Isabella, the daughter of King John I of Portugal. He spent nine months in Portugal and came back to his homeland, successful in painting the soon-to-be Duchess of Burgundy and the contract for marriage. Her portrait was a sincere portrayal of the sitter, which showed that she was not a beauty. It was a pity that this painting was lost. Although Hubert, the oldest of the van Eyck brothers and other siblings painted, Jan van Eyck, who was younger, was the most famous among the family members. Hubert an Eyck started the Ghent Altarpiece, but most of the work was executed by Jan van Eyck due to the early death of Hubert. This panel, created in the 15th century, was a huge polyptych panel painting that measured 11 feet by 15 feet when opened. It consisted of 12 panels, eight of which were hinged to form the panel’s shutters. The back of these shutters were also painted, giving a different view. Also called the Adoration of the Mystic Lamb, the front of the shutters shows the Annunciation of Mary on the uppermost level. The rightmost and leftmost panels on the lowest level show the portraits of the donors, Joost Vijdt and his wife, Lysbetter Borluut while the inner panels on the lowest level have the images of St. John the Evangelist and St. John the Baptist. The inner paintings when the altarpiece is opened showed various Biblical scenes. This panel painting showed an unheard of realism to the figures and themes in late medieval art during that time. Jan van Eyck was unrivalled in his pictorial illusionism skill. His paintings were very detailed, showing his keen observance of nature and he was highly skilled in the manipulation of oil paints. 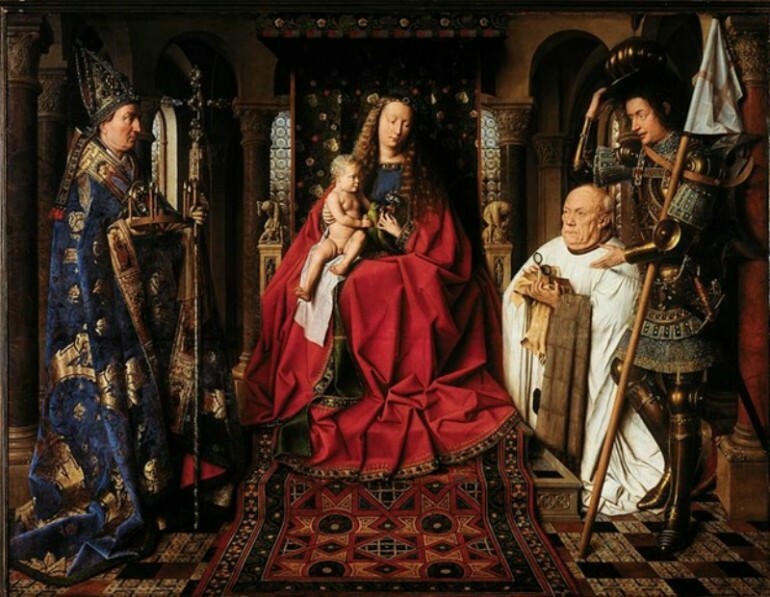 Even critics were amazed at his ability to reproduce reality and recreate how light reflected on different surfaces such as glass, metal to opaque surfaces, which can be seen in his painting, the Virgin of Canon van der Paele that was created from 1434 to 1436. While Jan van Eyck was known for his objectivity, his works are notable for their fictional approach. His absolute artistry dazzled and deceived the eyes of the viewers. His chiaroscuro (grisaille) statuettes simulated actual sculptures and his inscriptions resembled carved lettering. His painted mirrors reflected views that were imaginary or unseen events that were happening outside the canvas. In one of his works called the “Arnolfini Portrait,” the mirror on the back wall showed the reflection of two figures entering the room, one of them being the artist himself, creating a continuity between the fictitious and real worlds. With the great demand for his work, many variations and copies were created by his workshop assistants, which contributed to his fame all over Europe. When Jan van Eyck died in 1441, he was succeeded by Petrus Christus, who adopted his style. He was not dependent on commissions to make a living because he received a regular salary from the Duke, therefore he was able to paint at leisure. He created religious and secular paintings and portraits. With oils slow to dry, van Eyck was able to manipulate the medium, as its property gave him the freedom to blend and mix layers of various pigments, a style that was also adopted by later painters such as Rogier van der Weyden and Robert Campin and generations of Early Netherlandish painters in the late 15th and early 16th centuries.